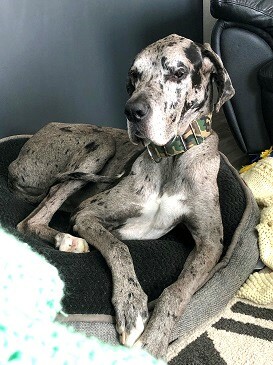 Brutus - Rocky Mountain Great Dane Rescue, Inc.
Hey there, I’m Brutus! 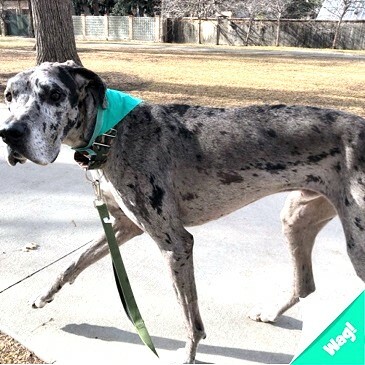 I’m a 7 ½ year old merle male Dane with natural ears. I’m a sweet guy looking for a great home to call my own! 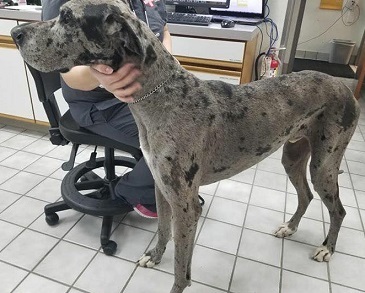 I’m good with other larger dogs, but not so much with the smaller dogs – I’ve been trained to hunt for moles, so sometimes that instinct can kick in, especially around cats. I have been living with dogs, cats, a pig, pigeons, and a turtle in my foster home and have been doing well though. I’m also really good with kids and strangers too. 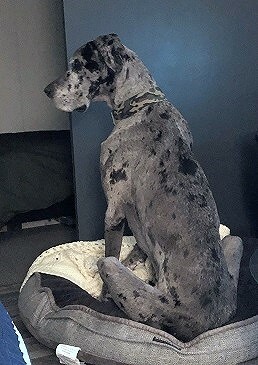 I’ve been going to work with my foster mom and I love all the new people I get to meet! I know all of my basic commands and am housebroken. I’m also trustworthy with free roam and walk really well on a leash. I haven’t spent any time in a crate, so I would need some time to get used to one if you have one, but if you would give me a chance with free roam, I promise I won’t let you down! I think that covers just about everything, but why don’t we get together to see if you could be my perfect family?